Terra Damnata, the first novella-length work from up-and-coming writer James Cooper, is an oppressive slice of suburban life. Arthur Woodbury is faced with a sickening decision. He has been offered the chance to pay off his debt to local casino owner Norman Foley. The only snag is that he must sell the corpse of his dead daughter to wealthy businessman Gerald Appleton. While the reason behind Appletonâ€™s request to purchase the mortal remains of Arthurâ€™s daughter is macabre rather than sinister, true horror awaits the Woodbury house as soon as the deal is struck. Sombre and oppressive, Terra Damnata is exquisitely written and despite Edward Millerâ€™s gleefully ghoulish cover is concerned not with supernatural chills but the horror perpetrated by men. My only complaint is that it was just too damned short. The story, at times reminiscent of a 1950s thriller, could have easily been expanded without losing the doom-laden atmosphere and at points felt a little rushed. 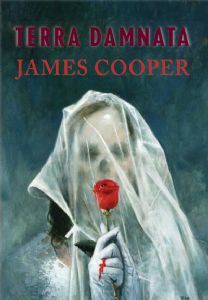 Of course, this could be just because this reviewer was so enjoying Cooperâ€™s taut, considered prose that he didnâ€™t want it to come to an end.